Enough with the distractions and being impressed with myself, time to build some furniture with my new workbench. 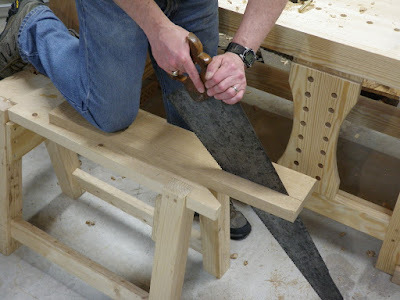 I'm building "The Lost Stickley Side Table" reproduced by Robert Lang in Popular Woodworking's Arts & Crafts Furniture Projects. Only one example was ever known to be made, presumed to be a prototype that was too complicated to go into mass production due to its angled legs. 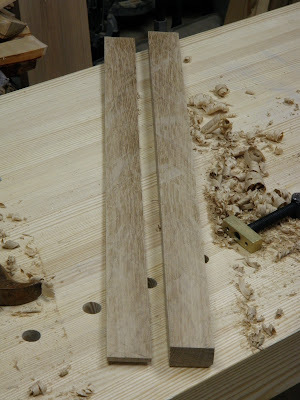 I'm using quartersawn white oak, starting with the legs. They're formed as a lamination that shows quatersawn figure on all four sides. The core is two pieces of 13/16", for 1 5/8" total width. These are then faced with a 1/8" veneer front and back, for 1 7/8" depth. 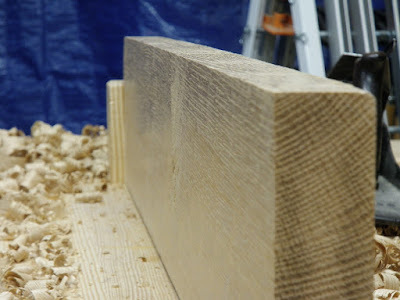 Starting from rough 5/4 stock, I broke it down to rough 28" lengths, planed faces and one edge, and ripped to 1 3/4" width. 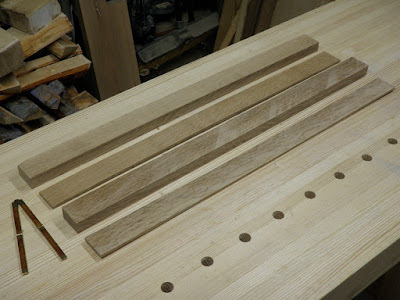 Then I resawed these pieces to get one central core piece and one veneer piece from each; I need a total of 8 to form 4 legs. Cutting the rough board to leg lengths. 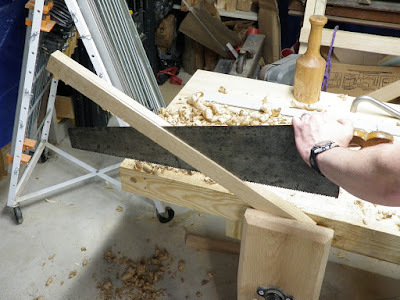 Rough planing with the jack, several passes each of alternate diagonals and then down the length. 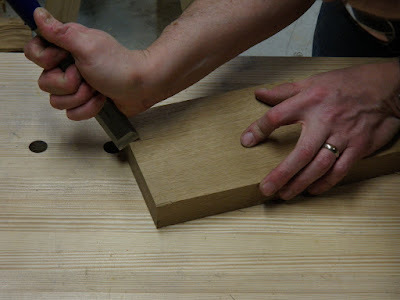 Flattening with the jointer, followed by a few quick passes from the smoother, then edge jointing. Yeah, I took my sweater off, this keeps you warm in a cold basement! 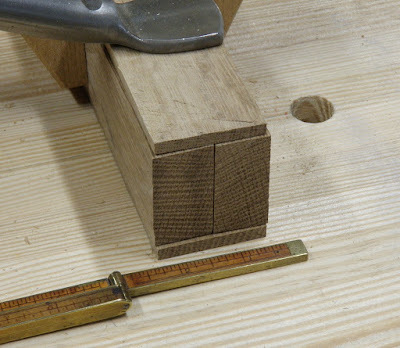 Gauging the thickness for the opposite face. 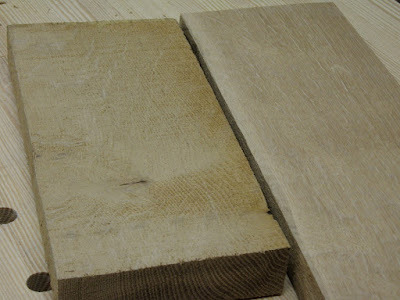 Showing what a nice surface this oak takes after less than 10 minutes of planing. 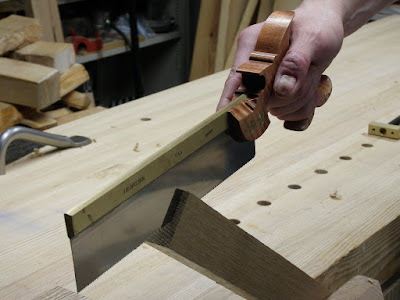 Making a starting notch for the rip cut. This allows a precise start. 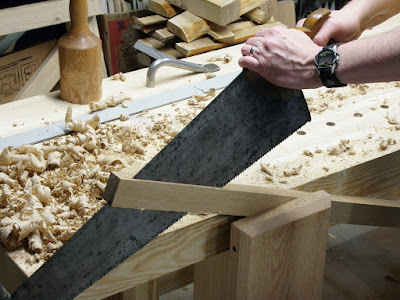 I don't have much spare wood, so I need to make these rips good and split the line. Finishing off the next rip. For the resawing, I gauged it to 1/4" for the final 1/8" veneer, since the 5/4 stock gave me at least an extra 1/4", even after planing. How do you resaw a 1/4" thickness 28" long? Very carefully! 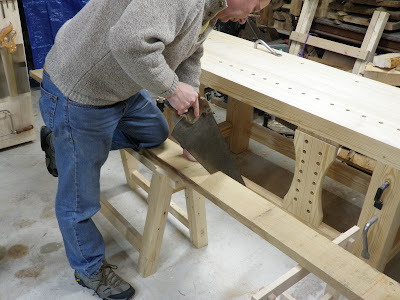 Establishing the kerf with a dovetail saw for maximum control. Using my large ripsaw for the rest. How did all those shavings magically appear after that last picture?!? Here you can see the thickness I'm trying to maintain. Halfway through, alternately flipping the piece every few inches. The resulting veneer and core piece. 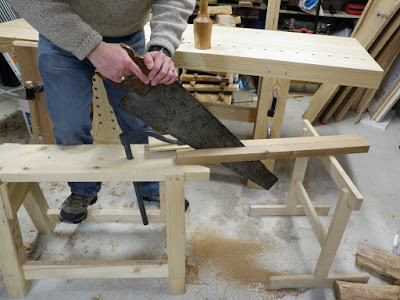 The four pieces needed to form a leg. Front two are cut-side up, rear two planed-side up. The pieces dry fit to show the lamination structure. This will leave plenty of fat to plane down to final precise dimensions; I'll just need to pay attention to grain orientation so it runs in the same direction on all pieces that form a face. 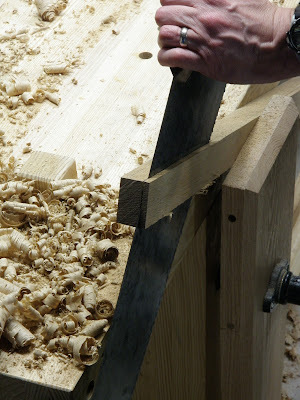 This lamination construction allows me to avoid having to thickness-plane the thin pieces. 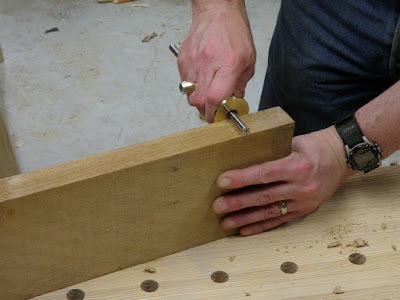 Planing really thin stock is tricky to manage, and it doesn't take much to ruin a piece. I'll just glue the planed faces of the core pieces back-to-back, plane the sides flat after the glue has set, then glue on the veneers, planed face down. Once that glue has set, I'll plane all four rough faces to thickness and smoothness. Just three more legs to go! I finished mine yesterday - slightly narrowed, to fit a specific space, and in mesquite. Hope you enjoy this project as much as I did!